Here is a Google Earth KML network link that displays a big variety of tile based online maps (road maps, terrain and contour maps, alternative satellite image sets, etc) in the area you are currently viewing. Whenever you change the view in Google Earth, the image overlays are automatically updated. 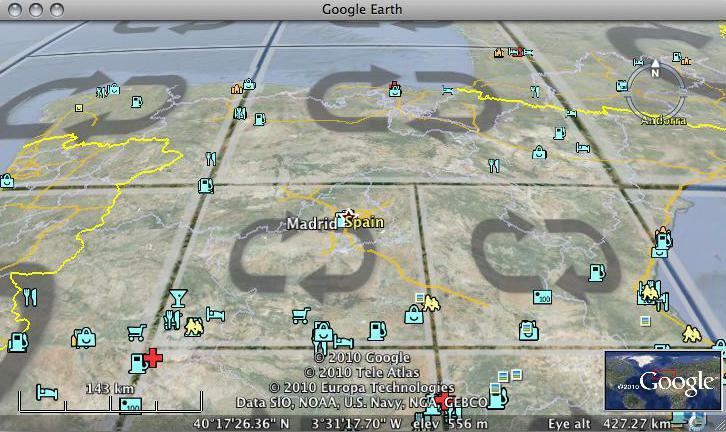 Zoom levels for map tiles are calculated independently for different regions in the Google Earth screen, based on distance to the virtual camera and on latitude. Consequently, maps are updated very quickly and the number of map tiles loaded per update is more or less constant, even if the view in Google Earth is tilted. Some more questions about how it works are covered in the FAQ. To get started, simply download the file map-overlays-for-google-earth-combined.kmz (please log in first, see here why) and open it in Google Earth. It contains all map sources that this application provides (version 10). One huge gigantic THANK YOU! 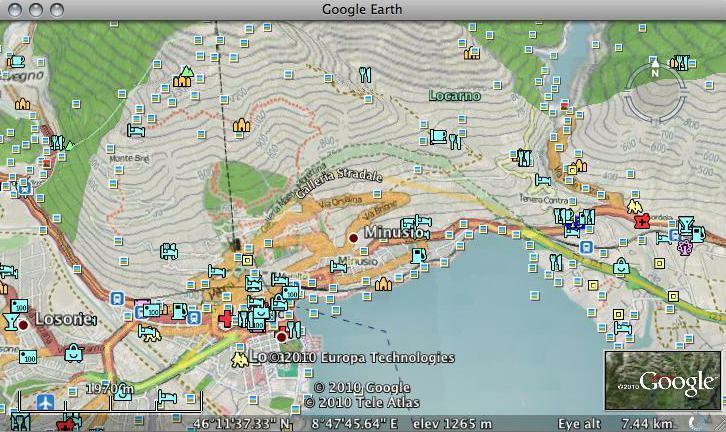 Its been really tough trying to piece together hikes with google maps in firefox and the google earth standalone. This is tremendously helpful and greatly appreciated. Great job, Congratulation for the version 2. Just an idea, could you display a blank (black or white) map background? I'd like to add my thanks, and congratulations on the update, it works fantastically. Very thank you!!! 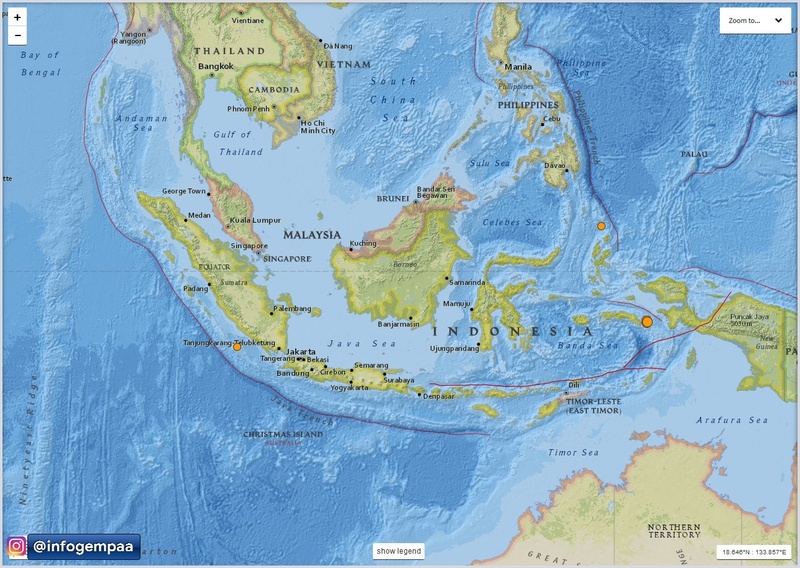 Government sites and many services should implement this type of GE-map-overlay in their sites. We have real nice local government GIS-Maps, some with GPX, GeoJPG and more features (german & italian language): http://www.provinz.bz.it/in... - here it is even possible to download DXF/SHP (top left download):http://gis2.provinz.bz.it/g...- How difficult would it be to make a ge-map-overlay for the gis2.provinz.bz.it-data? On the other hand, cloning and adapting the code for your maps should be doable (given that there is a way to map coordinates to image urls). Version 3 is online now. It utilizes resources more efficiently and contains 12 new map sources. The openpistemap layer does not work anymore. 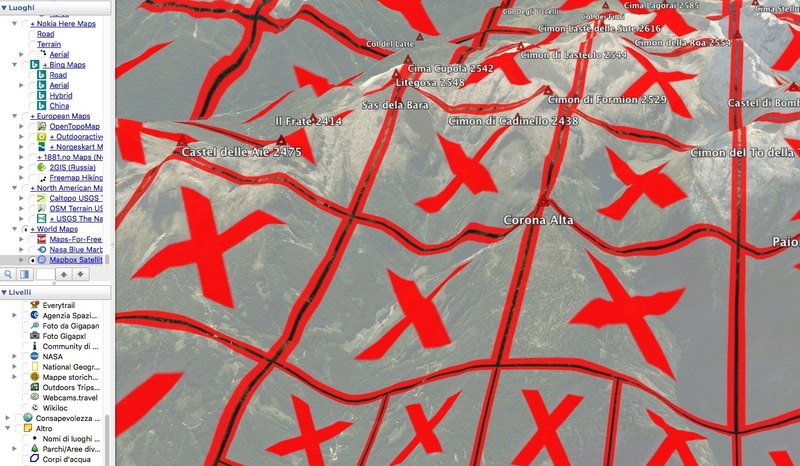 However, the osmarender maps also contain all ski lifts and slopes. Wow! Got it to work. Amazing! Thanks. Unfortunately the "outdooractive"-Map doesn't works anymore. Outdooractive.com have changed their servers a short time ago. Please look at this problem - the outdooractive map ist very good and i would be very happy if i could use it in Google Earth again. Thanks for notifying, it's fixed. Hi, congrats for the great overlay! thank you very much for sharing this app! you did an amazing job! but this just causes distortion... any advice please? After quite some time there's a new version that mainly updates the application to a new Python runtime (because Google deprecated the old one) and that slightly restructures the groups of map sources. In addition to that, the Google Maps Terrain and Mapquest Open Aerial layers work again. Furthermore, the Outdooractive Germany layer again shows the hand-drawn topographic maps in the highest zoom level. I will have a bit more time in the following days, so if have any suggestions, please post them here. This is brilliant! Good work on this! I have a suggestion for a new map source: OpenStreetMap GPS Traces. a Nautical sea chart would be useful, there is a way of getting something like Navionics web app into gogle earth? Nokia here maps overlay is not working at the moment? thanks for that great service! can you add the outdooractive winter map with the layer showing the pith? it's very useful for planning ski and snowboard trips. I have an request for two map source to put in this package. Here is the link for the exact resolutions that would be used with the google maps api and statkart maps. If you want to do me to me a favor, then please add a Norwegian description in the comments box of that site so that it can be found by Norwegians on Google. About the Svalbard map: I didn't manage to find a working tile url. the Navionics maps does not work with this site (it has a different tile url scheme), and currently there is no good sea chart out there yet. In one year or so http://www.openseamap.org/ might be usable. Extremly helpfull this overlays ! Norwegian aerials: http://www.1881.no/Kart/# go to "Foto"
Switzerland maps and aerials: http://map.search.ch/ for aerials go to "Luftbild"
Really wish you would allow the overlays to be used even if a new version is available. It's quite tedious to have to download and install every time. Especially because I like to rearrange the order, and delete overlays I don't like or won't use. In the beginning I had separate versioning for map groups and even single map sources. This had two problems: It was quite difficult to get working right and people never came back to this site (which pays the server costs through ads). I could build a more fine-grained update solution, but that would require me to ask for a usage fee, which I guess nobody wants. Is it maybe possible to publish the python code? I would really like to use it with my own layers locally! I use this site to make some minor advertising money on the side. If I would publish the code, everybody could fire up it's own version on Google AppEngine in 10 minutes, which is certainly not in my interest. 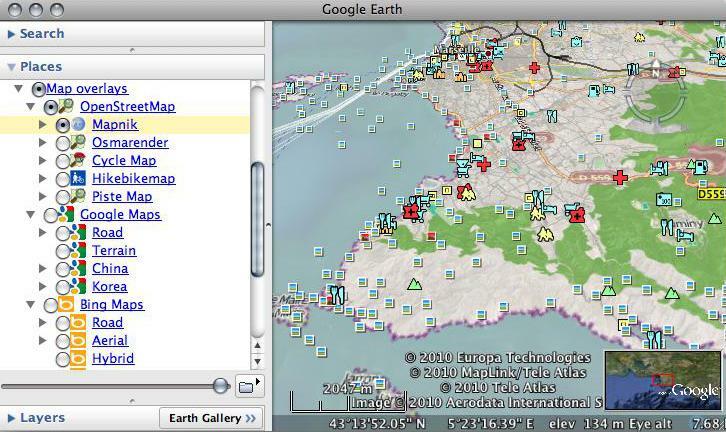 The swiss maps are unfortunately not compatible with this site and Yandex blocks the Google Earth client. Many thanks for your effort ! I'm daily active on GE and your overlays are a big help for safe time when compare with other resources. Jesus Christ! This webpage is literally the best thing that has ever happened to Google Earth! Would it be possible to have layers from Apple Maps/Imagery? You have Google, Bing, and Nokia, which are all major mapping service provider. And even better... leave it open for people to provide their own tile source settings. But I understand that could create a lot of junk. Martin, Thank you times a million. Google really should pay you handsomely for this (better yet, hire you!!). Really and truly, this should have been an included Google Earth feature from the get-go. But your clever .kml works perfectly! Outstanding work. Thanks. In enjoy it myself very much very often and feedback like this lets me keep this public. Version 10 is out and has 4 new layers. I have already have overlays built in Google Earth that I would like to see them on top of these map layers. Is there any way to send these map layers backward and bring my GE layers forward. I can see my waypoints (placemarks) but little else on top of these new Map layers. Would love someone to make the same for the Irish Ordinance Survey maps covering the last 170 years. Mapviewer here http://maps.osi.ie/publicvi... . But can access tiles directly i.e. http://maps.osi.ie/publicvi... .. There are 8 different map layers in the system that would be great to combine with other sources in Google Earth. Big thanks for these wonderful packs of map layers that include so many of the numerous OpenStreetMap-based layers. This is really a great service that I hope gets more publicity as it helps put OSM at the hands of so many people that use GE. Thanks also for your latest addition of three more Thunderforest styles (by Andy Allan). Great additions. * You might want to move the currently named "Cycle Map" layer under Thunderforest in your next version as it's also a "Thunderforest style" (by Andy Allan) and rename it to OpenCycleMap, which Andy uses for it. * It would be great and also inline with the licenses / use permissions of the map styles to include appropriate map (tiles) license information (that would include attribution and note of the license under which the different OSM maps are offered for reuse and distribution). While the relatively new ODbL license of the OSM data allows nowadays to publish maps created with OSM data under traditional restrictive licenses I think that all of the maps you have included here are licensed under a permissive license or at least there's some sort of fair use clause for their use that allow using these. But the license and the attribution should be included in the layers and visible (clearly enough). You already have very good attribution on the pages of the individual map styles and the grouping of the layers in the layer pack indicate attribution (including the use of the logos). But I think the license would be an appropriate addition and would be good to follow the styles consistently. From the top of my mind I think that there would be three good places for the attribution/license info: i) these web pages (as you already have for attribution), ii) the Properties > Description box for each of the map layer (that currently have the URL to the info page of the given layer) and finally it would also be great and appropriate -- and I think many would argue that also required -- to include the info in the map browsing window. E.g. OpenLayers plugin for QGIS does this nowadays automatically albeit the info is not perfect for all available layers. But the MapQuest OSM style is a prime example of attribution and license statement done right. (Lower right corner gets a text of "Data, imagery and map information provided by [MapQuest], [OpenStreetMap], and contributors, [CC-BY-SA]" where  brackets indicate corresponding hyperlinks). I would be happy to help you figure out an appropriate placing of the license and attribution if you want/need help. * It would be great to see the Humanitarian map style added to your layers. The style was developed originally as part of one Humanitarian OpenStreetMap Team mapping project to function as a general map style with a twist/focus for the needs of humanitarian and international development work. But it's really a general style well suited for many needs. The style is available at https://github.com/hotosm/H... , the tiles are globally created and available via the French OSM community's server http://layers.openstreetmap... and they are also available among others at osm.org . If you have any questions regarding this don't hesitate to contact me or yohanboniface (the main developer and maintainer of the style). Again, BIG thanks for this wonderful set of map layers! Look forward to inclusion of more good layers and the tweaking of the attributions/license notes. thanks for your comments, I'll consider them all. You are right, I will have to do something about licence information. What about yahoo maps? is there any overlays for yahoo satellite maps? Yahoo unfortunately blocks requests from the Google Earth client, so it is not possible. There are 7 layers but the most important are 4: Ortofoto 1954, Ortofoto 1968, Ortofoto 1977 and Ortofoto 2000. Hi Martin! Have you considered adding the Strava heat maps as a map source? They would be a great help planning trips in Google Earth. These overlays amazing, thanks for sharing them! I have one doubt using google maps terrain overlay, if I keep zooming it keeps showing the countour lines, whereas on google maps they disappear after certain zoom, probably due to its low resolution. Is there a way to make the contour lines disappear from google earth overlay as well after zooming enough? state, county, city, special district and non-governmental agency holdings are included and have been mapped at high levels of accuracy. Does anyone know how to do an elevation map of this map? Can anyone reproduce this? Does anyone know how this was produced? https://uploads.disquscdn.c... How would I reproduce it? Thank you. Can someone help me work out how to do images 1 and 2 from then Terrian analysis tutorial? Thank you. Is it possible to add the info from http://www.opensnowmap.org/ as overlay? Great site! Would it be possible to add the Dutch opentopo maps as overlay? Any chance to see also openmtbmap.org map? I'm a Top Contributor on the Google Maps and Earth forum. We constantly recommend your product and have for years but we have had complaints about some of your slightly deceptive download buttons. I know you have to support the site but Google is not in favor of this practice. I also just noticed that your comments section is supported by Disqus. Disqus is a slightly obnoxious tracking company that I normally wouldn't use for comments but I'm making an exception because of the quality of your product. I'd appreciate it if you considered a more straightforward business model. this whole things started with me wanting to have map overlays in Google Earth for myself. I enjoy cycle touring and hiking and having these maps alongside with 3D terrain, Panoramio images and other placemarks makes planning a trip a great fun for me. Once I built the software, I thought I might as well share it because I knew it might be a thing that other like-minded people would appreciate. About the business model: Running this thing costs some money (not much), which is easily covered by the Adsense revenue (about 200 Euro / month, also not much). I'm a full-time employed software engineer (https://www.linkedin.com/in... ) with two kids, and I absolutely have no time or ambition to implement other revenue streams such as donations or subscriptions. So ads are going to stay on this site. I unfortunately don't have any influence on what ads are served by Google and (living in Germany) I have never seen "download buttons". But I'll address this by marking banners more clearly with some text around it such as "Message from our sponsors". About Disqus: I have absolutely no time to implement my own comment system and to deal with comment spam and security. Disqus does a great job for me in terms of not having to bother about spam. If you can suggest another worry-free hosted comment system, I'd be happy to switch. Can you update the URI to have them working again ? I plan to take some time for this during the second week of March. Hi Martin, thank you for your great job! Have you seen the watermark "API Key Required" in the Cycle map layer? Here seems to be broken... Also chiming in for wanting Strava heatmaps! Has anyone managed to remove the watermark "API Key Required"? Thank you very much for this! Now I can easily plan my hikings in Colombia. Keep this excellent work! From what I can see this can't be done at the individual user level though. I it needs to be done by Martin & from what I can see, there may be some cost implications. Have you looked into removing the "API Key Required" watermark from the Thunderforest data? How do I get GE to observe the api key I have from Thunderforest? Hello, I need to have this in Google Earth. 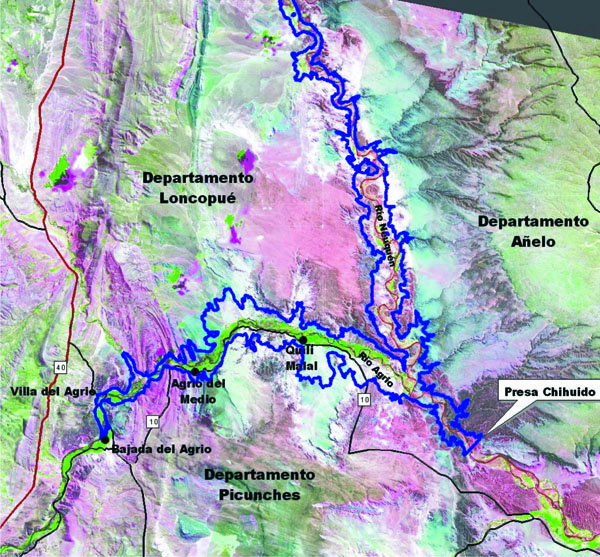 It would just be wonderful to be able to see the topographical maps of the Brazilian army in Google Earth. thanks for these map layers! I use them basically every day. However, in the past few months, the HERE maps seem to be broken - could you please check on them? Hi Martin, this is just what I need. Thanks for your work. I wonder if you can make USGS World Terrain Maps? I'm looking for a Google Earth Map Overlay that shows topography in a colour format - please see http://en-gb.topographic-ma... for the sort of thing I am looking for. This website doesn't integrate with google earth, do you know any that can provide topography in a format that would work with google earth? All maps for Norway are broken. Can you please verify the links? Thanks! How do I remove the API-Key required watermark on Thunderforest maps? Are there Topomaps available for New Zealand? Hi, just wondering if the current Navionics API might work? Would be really good to see Navionics!